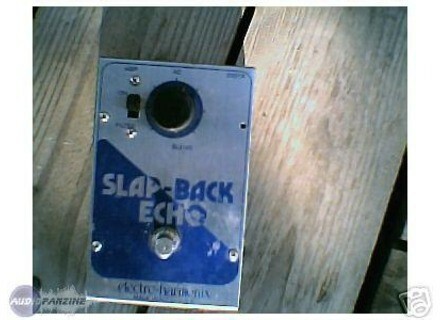 Slap-Back Echo, Delay/Echo/Phrase Sampler for Guitar from Electro-Harmonix. The Electro-Harmonix Slap-Back Echo is an analog pedal with one purpose in mind - to give you some sweet sounding slap back delay. The pedal is a vintage one, and is no longer being manufactured. It has standard 1/4" TRS connections and isn't rackable as it is a stomp box. 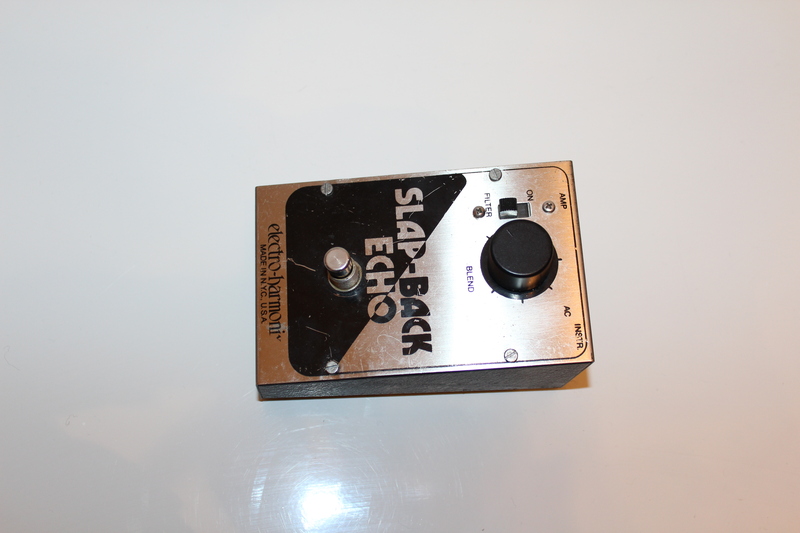 The make up of the Electro-Harmonix Slap-Back Echo couldn't be any easier than it is. All that is available to control is a large 'blend' knob and a switch to turn a filter on or off. There are no other parameters whatsoever here, so while your versatility is limited, the sound that you can get is pretty awesome. Since it is so simple and easy to use, a manual is surely not necessary, a hard copy of which would be incredibly hard to find anyway. 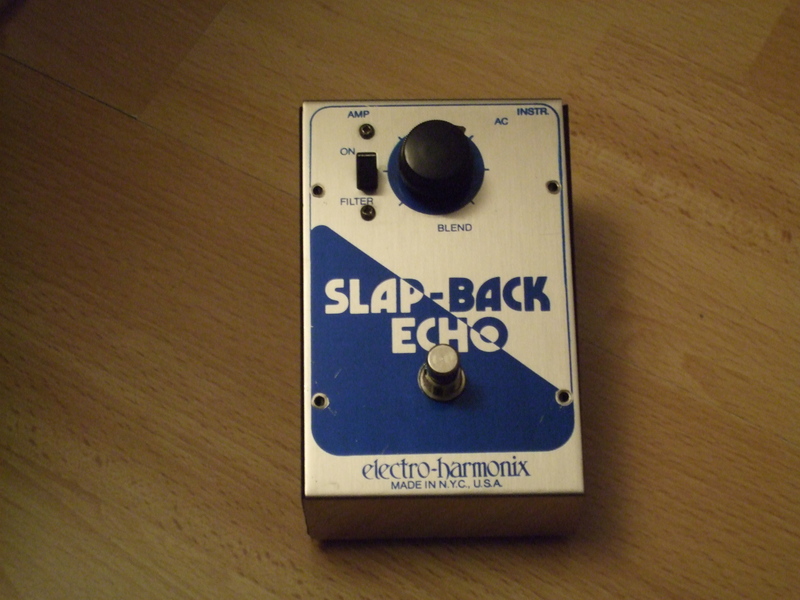 In terms of the sound, the Electro-Harmonix Slap-Back Echo definitely provides you with some awesome, although limited, slap delay. The blend knob will give you a fairly good amount of different sounds, but since you're limited to just this, it is hard to get too much versatility. I have used the pedal for recording with a Fender Stratocaster and a '76 Fender Twin Reverb, which in my opinion is the perfect combination for use with this type of pedal. I love using this is a very subtle slap back, but it also sounds great when it blend is cranked up! 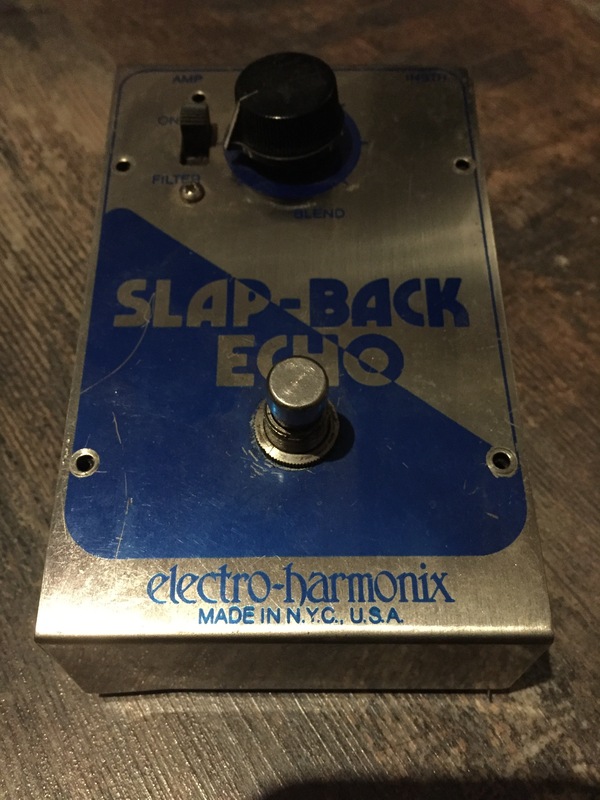 Although rare, the Electro-Harmonix Slap-Back Echo is definitely available on eBay enough where you could snab one up for sure if you so desired. While not versatile enough to replace your Memory Man or other delay, this is the perfect little pedal to use in tandem with something like that to give you some varying delay tones. If you just use this pedal on its own without the use of anything else, the pedal still shines. There aren't too many pedals out there that are devoted to just slap back echo, so definitely check this gem out!